The international tyre major, Apollo Tyres on Tuesday introduced a specially developed semi-lug commercial vehicle bias tyre for the Bangladesh market. 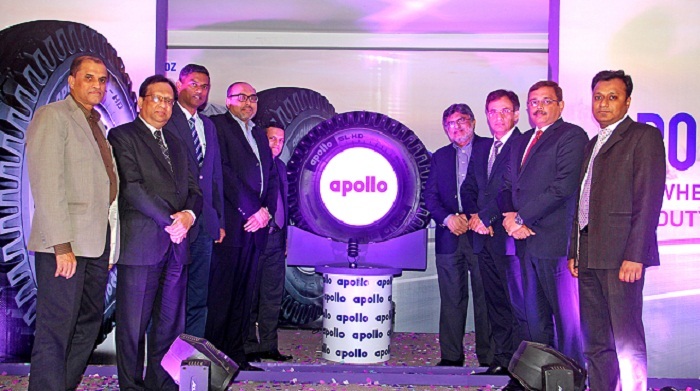 Coined as ‘Apollo SL HD’, the tyre was presented today to the company’s business partners and fleet operators in Bangladesh by Rajesh Dahiya, Group Head, Sales – India & SAARC, Apollo Tyres Ltd and Mohamed Ismail, Chairman of Rahimafrooz Distribution Ltd.
During the launching program was also present Aravind Krishna, Rajesh Udaykumar, Ariful Karim from Apollo Tyres Limited and Muddssir Murtaza Moin, Altaf Hosain, Mokhlesur Rahman and Kazi Abidul Hoque of Rahimm Afrooz Distribution Limited. Designed and developed at the company’s Global R&D Centre, Asia to suit the application and terrain requirements, these tyres have been tested extensively for more than a year before being introduced today. This market, unlike others, is dominated by Semi-lug pattern and is used as an all wheel tyre which is more economical as it can be used in front as well as rear wheel. With a market potential of nearly 75000 per month commercial vehicle tyres, including heavy, medium and light trucks, of which 55% is bias, the company is looking at increasing its market share in this South Asian country riding on the success of Apollo SL HD.